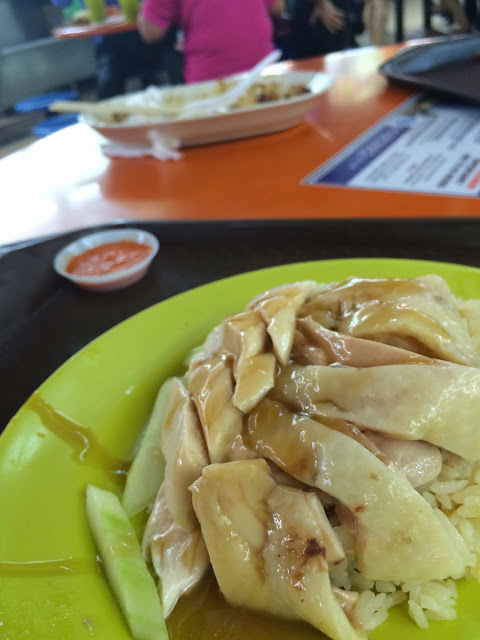 Chicken rice is one of the most iconic Singaporean dishes, despite its confusing Chinese name of Hainanese chicken, which refers to a province in China. The chicken is soft-boiled then plunged into ice water to retain the springy skin and prevent overcooking. The cooking broth, which has all the chicken essence and oil, is then used to cook rice. The dish is served with a trio of sauce: thick black soy sauce, chili sauce and a ginger paste. Tian Tian in Maxwell food centre near Chinatown is renowned for their chicken rice, and it’s true you can’t miss it because it simply has the longest queue and photos of Anthony Bourdain’s thumbs-up at the kiosk. I beat the queue at lunch and opted for the standard at SGD 3.50 (c. £1.80). The rice was soft, fluffy and fragrant; it was excellent. The chicken, on the other hand, though succulent and soft, was a bit lacking in terms of flavour. And this isn’t just at Tian Tian; I checked out high-end chicken rice at Chatterbox, successful chain Boon Tong Kee and the more traditional Wee Nam Kee too. I am at the risk of offending the entire nation here, but chicken in Singapore is... bland. This is largely due to the Centralised Food Processing the government enforced, for health and hygiene reasons (and probably why there is no bird flu here). However because there is no fresh chicken, the dish loses its colour. There is general consensus that certain restaurants in Hong Kong actually does chicken rice better… but let’s not go down that route. Also note, Anthony Bourdain only said the rice was so good he could eat it on its own, he didn’t say the chicken was. It’s still good, especially the rice… please don’t deport me. Literal translation is pork rib tea. My first encounter with bak kut teh was in my teenage years when I was on holiday in Malaysia. I didn’t like it back then; we had it for breakfast as per local tradition, but it didn’t feel right to have pork soup for breakfast, not to mention the overpowering Chinese medicinal herbs. Since then I have been exposed to much better versions and bkt has grown on me. There are 2 types of mainstream bkt, one originated from Chiuchow (Teochew) and the other from Hokkien. The Teochew variation holds very strong flavours of Chinese herbs and spices, not dissimilar to traditional medicines with its pungent smell. The Hokkien version is much milder, the heady spices are replaced by peppers, which made the soup fiery on the nose, but very gentle on the tongue. I prefer the latter. I suppose every restaurant would have their own recipe for this traditional dish. Ng Ah So and Founders are arguably the most famous for their bkt on the island, both served patrons of celebrities and global leaders. I chose Founders based on the cabbie's recommendation. The broth was delicious, packed with meaty sweetness and peppery fragrance. I particularly liked how it was almost grease-free. The ribs were soft and tender, not to the point that the meat was hanging off the bone, it remained firm with some structure, but was effortlessly torn off the bone when I bit into it. I ordered rice to go with the soup, dipped the meat into the viscous sweet soy sauce and started slurping away. They offer unlimited top up for the soup, too! Bonus. The dark soy marinated beancurd was also quite good, though the bkt alone was more than enough to satisfy my tastebuds. Prawn mee is another iconic staple of the locals. One could choose to have it dry where the noodles are served on the side, tossed with oil and sprinkles of lardons and the prawn and pork soup as the main event, or with the noodles soaked in soup. I had mine dry with eggy noodles from the Zion Riverside food centre, where the stall is famous for the enormous prawns they serve. The owner manage to source giant king prawns and the price of your meal depends on the size of prawns you choose. It was truly impressive; the noodles were bouncy and full of chew with the occasional crunch from the deep-fried lardons, and the soup was out of this world - packed with oceanic sweetness supported by a sturdy pork bone base broth - stunning. I am lucky enough to not have experienced bad kaya yet, and I don’t know enough to tell this from Ya Kun, the sweet coconut / egg yolk spread were both addictively good. What is very worrying is the amount of butter these cafes tend to put in the toast; a 0.5cm thick disc of butter that covers 70% of the toast surface, on each quadrant! Amen to arteries. The soft boiled eggs are my kind of thing, though I know a few people who’d find it too raw or too “snotty”… Unfortunately the local kopi doesn’t do it for me, I shudder at the bitterness from over-roasting of cheap coffee beans, no amount of sugar or condensed milk could cover that. I still think it’s coffee-flavoured ink. Apart from these, I also checked out fried kway teow, fried tow kway, aka stir fry carrot (turnip) cake, pork congee and cheung fun... Some dishes didn't quite click with me, either I haven't found a good stall or it's not my kind of dish, but very glad to have sampled the range and worked my way round the local food scene. Time to get on the front foot for quirky and trendy eats round the city. I'm going to mix things up here, for a true East meets West experience. At the moment understanding how something which supportive like new york travel packages are the ones to use which i personally find helpful and works for sure. I'm not going to lie, I'm missing the food in London a LOT! A Decent burger, a juicy steak, some proper fine-dining... On the plus side, my Asian side is getting all the fix she needs! Bao and Yolkin new?